It's like domcomp. But on Android. Smart caching and mobile-optimization ensures domcomp is the fastest way to check domain names, wherever you are. Making domain prices more transparent and providing accuracy, clarity and impartiality are the reasons we created domcomp. We carried the same philosophy to mobile. Details matter. Up to date coupon and WhoIs privacy information ensures you won't miss out on the cheapest and best deals. 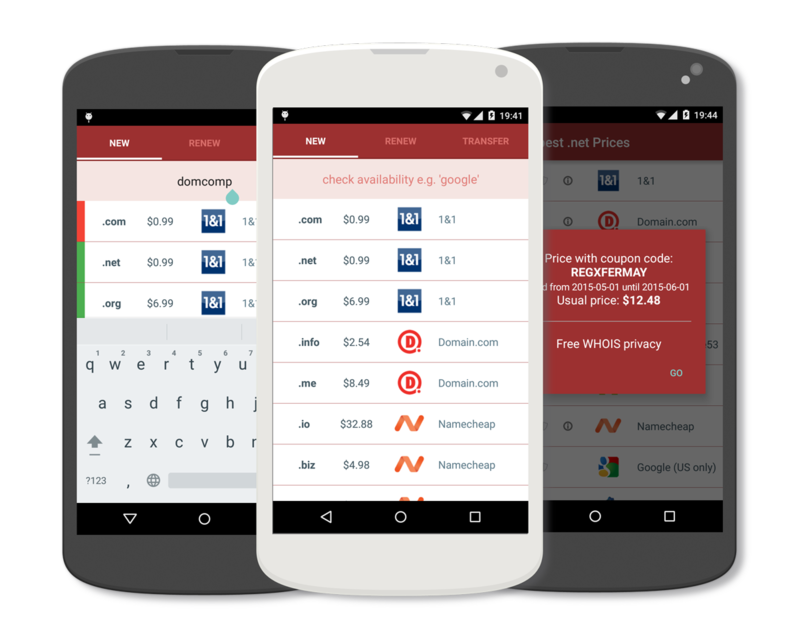 The domcomp Android app currently supports traditional TLDs and the most popular registrars. We've deliberately implemented a streamlined set of features to provide n optimal mobile experience in this early version. However, additional features and improvements are on their way. Feedback is always valued and welcome.